Hi, I’m using PPOM 16.9 and PPOM PRO 16.00 along with WordPress 5.1, WooCommerce 3.5.5 and WooCommerce Bookings 1.13.2. My problem is that after making quantity selections, individual prices don’t show and the total doesn’t update or show at all like it does in the link above. 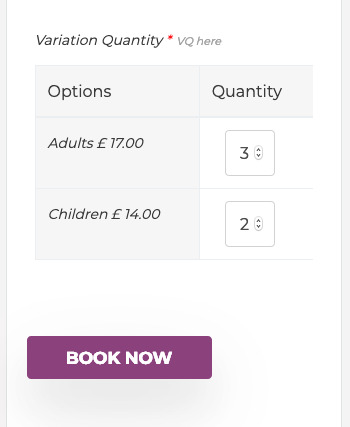 I have Show Each Option’s Price selected. 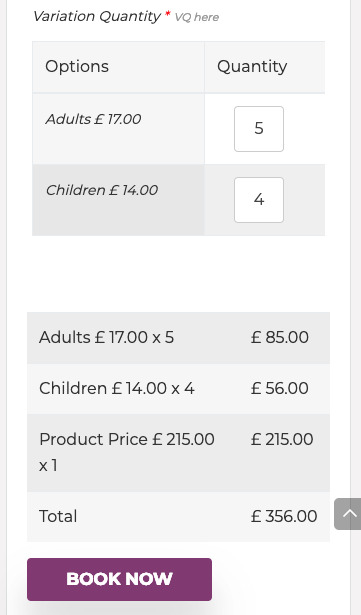 While the options do show in the cart, the additional options/prices are not added to the basket total. please share product page URL. I see, it’s seem some customization have been made on your product page, right? Because the price is not updating in hidden field with JS event. OK, it looks like it’s this particular theme’s WC product layout that I am using that causes this issue. The problem does not appear when another product layout is used. Thanks for your help. The topic ‘Variation Quantities not updating or showing’ is closed to new replies.